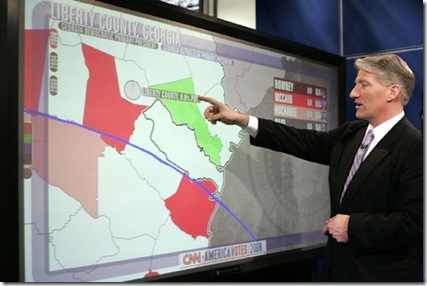 CNN Huge Touch Screen - The Magic Wall. I was glued to the weekends political coverage on CNN, not because I was interested in a winner, but I was very interested in the touch screen (The Magic Wall) being used by the senior political analysts. The company involved with this technology is Perceptive Pixel and CNN demonstrated some slick zoom in and out gestures, and were able to interact with things like Google maps. I thought I was looking at Microsoft Surface at first but looks significantly bigger and of course it looks like a TV. Unfortunately this retails for $100k so that puts it even further out of my price range than Microsoft Surface. Below is a cool demo of the technology!